The Sony RX1R II is the not-unexpected update to the 24-Mpix RX1R. It features the same 42-Mpix full-frame CMOS sensor as the Sony A7R II, paired with the familiar Zeiss 35mm f2.0 Sonnar lens first seen on the RX1. The 42-Mpix BSI CMOS features a variable optical low-pass filter with three intensity settings to control high-frequency detail and limit color aliasing during capture, but it lacks the ability of the A7R II to record 4K (it is limited to Full HD or 720p at 120fps). It also lacks that model’s built-in stabilization. Nevertheless, it has a much-improved hybrid AF system with 399 phase detection AF points that Sony claims results in an impressive 30% improvement in focusing speed. And despite the new RX1R II model sharing a similar size shell and the familiar (but not identical) ergonomics of its predecessors, Sony has managed to cram in a 0.39” 2.36m-Dot OLED electronic viewfinder like the pop-up type found the firm’s RX100 III. It also features a tilting 3.0-inch 1.23m dot LCD (albeit not touchscreen), an impressive ISO 102400 max sensitivity, and built-In Wi-Fi connectivity with NFC. 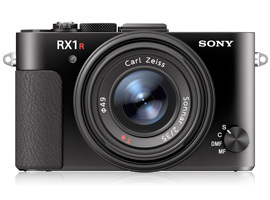 The Sony Cyber-shot RX1R II measures 4.5 x 2.6 x 2.8” / 113 x 65 x 72mm and weighs 1.2 lb. / 507g, body only. It is available to pre-order with a price of $3,299 (USD). The new RX1R II achieved an excellent DxOMark score of 97 points, with individual scores of 25.8 bits for color sensitivity, a wide 13.9 EVs dynamic range at base ISO (albeit slightly lower at base than the best tested), and a very good low-light ISO score of 3204 ISO. In terms of rankings, only the Pentax 645Z with its physically larger 43.8 x 32.8mm CMOS sensor (nearly 1.7x the surface area of a full-frame 35mm sensor) is ahead by just over a half-stop in noise levels. Sony-made sensors appear in the top 5 models in our database. Both the RX1R and RX1 achieved excellent scores for sensor dynamics, and the new sensor improves on those earlier models. Not only does the new sensor have a higher pixel count, it has lower noise levels overall, which contribute to the higher color sensitivity of 25.8 bits, including a mid-range boost from ISO1600 onwards and an impressive low-light ISO score of 3204 ISO. That’s close to a half-stop improvement over the earlier models. Sony has enhanced the dynamic range at lower ISOs so that it is now closer to the original RX1’s results for landscape photographers looking for the widest possible exposure latitude. At the same time, Sony has also significantly boosted high ISO dynamic range by around +1 stop from ISO1600 through the maximum, which should please available-light photographers. Color sensitivity is excellent on the RX1R II and is boosted from ISO1600 onwards. As with color sensitivity, the Sony’s high ISO dynamic range is excellent. High-end full-frame compacts remain relatively uncommon despite their cult following. With full-frame sensors and high-grade lenses these mostly hand-assembled cameras are immodestly priced. Rangefinders like the Leica M series must be considered rivals, but the new Leica Q with its fixed 28mm f1.7 lens is arguably the closest. We’ve also compared the RX1R II with the Sony A7R II to confirm if indeed the two use a similar sensor. In this group, the 24-Mpix CMOS sensor in the Leica Q is outshone by the dynamics of the Sony pair, which incidentally share a related sensor; however, the Leica sensor’s performance remains impressive. Significantly, the Sony RX1R II has a 1.5-bit advantage in color sensitivity at base that continues through ISO6400, which a good indicator of the lower noise levels of the BSI CMOS adopted by the Sony pair. Few could argue that the Leica Q has good dynamic range, especially at high ISOs, but with the exception of ISO800-1600, it doesn’t quite have the same latitude as the Sony, which has a wider dynamic range at base through ISO400, and then from ISO3200 onwards. Sony’s BSI CMOS has class-leading noise levels, and for our low-light scores, that translates to the RX1R II having about a half-stop advantage in noise over the Leica Q. The Sony RX1R II has excellent color sensitivity, and undoubtedly shares a related sensor with the A7R II. The RX1R II has excellent dynamic range, especially at high ISOs. It isn’t any surprise to see that the 42-Mpix sensor in the Sony Cyber-shot RX1R II is related to the unit in the Sony A7R II; however, the performance improvements over the earlier models are significant and help regenerate some the interest lost to the superb Leica Q. In terms of sensor dynamics, the Sony has the upper hand, but whether that and the inclusion of a built-in EVF is enough comes down to personal choice. While the two models adopt equally impressive lenses, it is the focal length, and thus the field of view, that’s likely to be most important single determining factor when choosing between the two. If you like the 35mm focal length, then the upgraded sensor in the Sony RX1R II makes a compelling case.